The Republican tax plan could squander some of Congress's precious recession-fighting bullets on a healthy economy. By deepening the national debt at a time when the economy doesn't need help, the tax overhaul threatens to leave Congress with less wiggle room to respond when recovery from the Great Recession eventually dies. "We should be paying down the debt now, so if we have a war or recession and we need to use tax cuts or increase government spending we're in a position to do so," said David Kelly, chief global strategist at JPMorgan Funds. U.S. national debt held by the public has nearly tripled over the past decade to nearly $15 trillion today. "It's wrong to deficit-finance a tax cut in a full employment economy when we already have high deficits," he said. Republicans argue that the tax plan -- which would slash the corporate tax rate to 20% from 35% and encourage companies to repatriate overseas profits -- will pay for itself with much faster economic growth. Independent analysts doubt that. In fact, the Joint Committee on Taxation, the Congressional scorekeeper for tax bills, estimates the Senate tax bill will only generate enough growth to create about $408 billion in net new revenue over the next decade. That means even including the economic boost from the tax plan, the bill would still add about $1 trillion to deficits. In other words, the tax cuts may pay for less than one-third of their cost. "It could leave the government with fewer bullets during the next downturn," Jaret Seiberg, managing director at Cowen Washington Research Group, wrote in a report. The eight-year-old recovery from the Great Recession hasn't been robust, but it has been resilient. It's already the third-longest expansion in history. While few economists anticipate an imminent downturn, another one will come eventually. And when that happens, the government's borrowing costs may not be as absurdly cheap as they are now. Seiberg wrote that the next recession could be "deeper and longer than it might otherwise be" if the government is unable or unwilling to pile on more debt due to the tax plan. Goldman Sachs recently warned in a report that larger deficits and rising debt could "reduce the ability to ease fiscal policy in response to an economic downturn." The Federal Reserve's options may be more limited as well. While the Fed has begun to raise interest rates and shrink its $4.4 trillion balance sheet, both remain near crisis levels. Fed chief Janet Yellen told Congress last week that America's debt burden is very concerning and "should keep people awake." Yellen indicated the problem will worsen as the country's population ages because spending on Medicare, Medicaid and Social Security will outpace tax revenue. The GOP tax plan could leave Congress with less financial flexibility to tackle these long-term challenges. To be sure, there is widespread consensus that the U.S. tax code is outdated and overdue for a makeover. But many observers don't believe the bills passed by House and Senate offer the kind of reform that's needed. 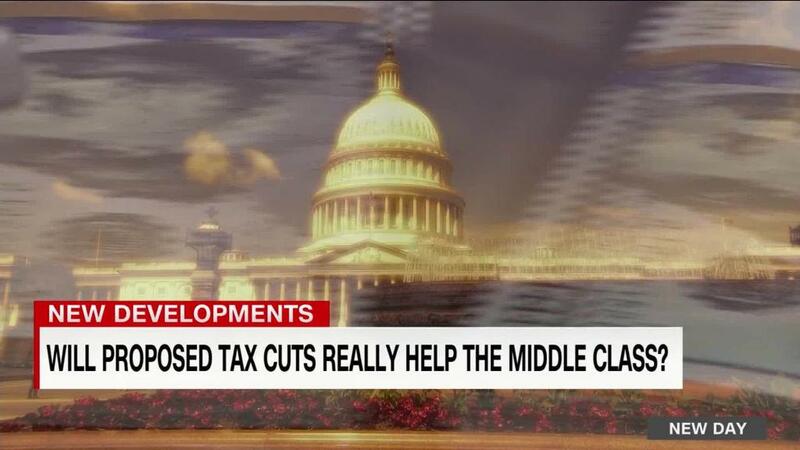 "These are deficit-financed tax cuts that do little to reform the tax code...The code remains complex," Seiberg wrote. Not only that, but the tax plan may not provide the kind of growth that would justify the cost. Goldman Sachs estimates that the Senate tax legislation would boost growth by about 0.3 percentage points in 2018 and 2019. Goldman said the effect in 2020 and beyond "looks minimal and could actually be slightly negative." JPMorgan's Kelly thinks the tax overhaul will only contribute "a little bit" to faster wage growth and hiring. Keep in mind the U.S. is already enjoying the lowest unemployment rate in 17 years and there is a shortage of skilled workers to fill record-high job openings. "We are basically out of qualified workers, or very close to it. That will limit economic growth," Kelly said. Will Main Street get a raise? Trump often mentions the trillions of dollars sitting overseas that companies would be given a tax break on if they return it to the U.S. Those repatriated profits could be used to hire more workers and boost wages. However, Goldman Sachs said "we do not estimate a growth effect from those repatriated profits." That suggests the money is likely to have a bigger impact on investors through massive share buybacks and fat dividends. Wall Street seems to be betting that many CEOs will spend their tax savings on shareholders, not workers. The Dow has soared nearly 1,000 points over the past month as the tax overhaul made its way through Congress. But markets are notoriously short-sighted and Wall Street's interests often don't align with Main Street's. "This is unambiguously positive to the stock market," said Kelly. "The real question is whether it's the appropriate thing to do in the long-term interest of the economy."